In the early 1980's when I was a street performer, mainly in London's Covent Garden area, one of the other performers was a classical guitarist called Bob Hoy. I always wanted to do an act with Bob, I thought he could be the musical accompaniment for the beginning of my act which was silent and quite slapstick but it never happened and we went our separate ways in the world. After a time of travelling my wife and I came back to London and I decided to learn classical guitar so that I could be as cool as Bob, but I was not a good student - there was something missing. One evening my wife and I attended a concert given by John Williams with flamenco guitarist Paco Peña and a Chilean group called Inti Illimani. Paco Peña supplied the missing ingredient - passion. After that concert I knew that I had to find out more about Flamenco and I found a teacher. My new teacher was called Ian Davies and sadly he passed away at a very early age. Ian was a great teacher but we didn't see each other all that often, I was a professional magician with my work taking me all over the world and Ian, like me, was not always in London. Over the course of 18 months I only managed to have 8 lessons but I think he instilled some good guitar habits and an everlasting passion for Flamenco. Ian gave up teaching and left the country to live in Spain and I never saw him again but his spirit stays with me. My wife and I eventually left London for a quieter life in the countryside and I continued to practise but without a teacher and I did find it hard. After 18 years of marriage we celebrated the birth of our daughter. There didn't seem to be much time for practise so the guitar was relegated and we got on with the job of nurturing our daughter. Then, out of the blue, disaster struck: I fell off a stage while performing in Germany and damaged my spine which eventually led to me giving up performing. But also it was difficult for me to hold my guitar comfortably for any length of time and again it got relegated. As a Christmas gift one year my wife gave me a ukulele, I thought of it as little more than a toy but I read some stuff on the internet and put some quality strings on it, this was a revelation, suddenly it sounded like a proper musical instrument and I started to experiment. After a bit of searching I found a video by Ted Robinson playing a Bulerias and I realised that playing flamenco was a possibility. I bought a tenor ukulele and put a low G string on it then I was absolutely hooked. It sounds good and it is so easy for me to pick it up and play without any discomfort to my spine. I can practise every day and still go about my every day business. I am so grateful to all of the people who post videos and give real encouragement that I decided to build a website (www.flamencoukulele.com)so that the information is easily available. And of course a huge thank you to Ted Robinson. The Flamenco Ukulele website took off with lots of interest from around the world and I have made new friends. 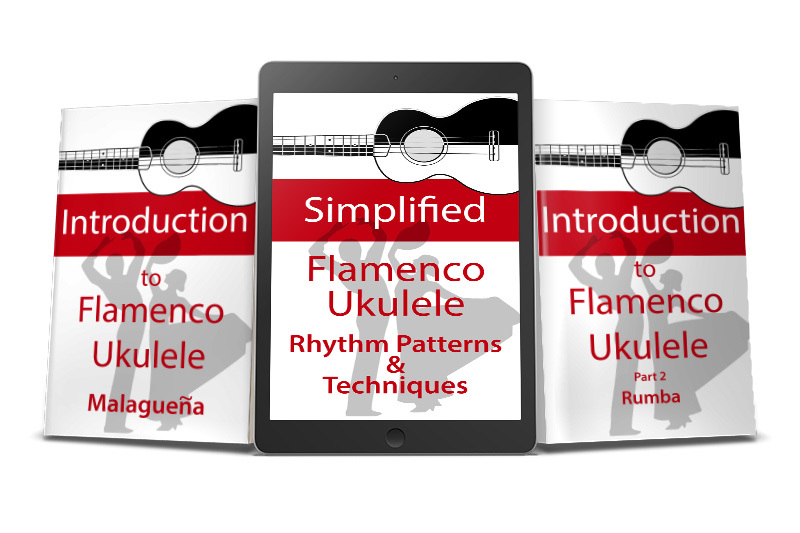 From there it has grown into a series of Kindle E-Books, I have composed and transposed traditional and modern Flamenco tunes for the ukulele and these are available for the small fee of £0.99 on the courses website. All-in-all I am having a blast playing my ukulele and have even developed a new comedy act with lots of visual gags and some great Flamenco tunes. I don't know if I will ever get the chance to perform the act in front of an audience but if I do I will write about it. Below are a few Flamenco tunes for the ukulele.